A more perfect replica of the country surrounding the shrine of Our Lady of Mount Carmel in Palestine would be hard to find, and the "Meek Mother-Maiden" did give many a sign of her protection to her clients in this new Carmel of the West. And it was at San Carlos Mission of Carmelo, that the superiors of the different missions convened and gave accounts of their work and numbers of baptisms etc. to the Father President. And how glowing are the records of those accounts! Here on festival days after the religious services were held social gatherings and entertainment's of the purest yet merriest order. Marriages, baptisms, all notable events had their share of attention. The hospitality of the missions, the care and kindness shown to the Indians, the numerous flocks, harvests and orchards which embellished them under the wonderful management of the good Fathers, all existed in copious measure at San Carlos. The huge, beautiful bells of this mission the chimes of which were heard clearly in Monterey were cracked during the years when the mission was neglected but some of the pieces were later recast and as far as known the present bells of the mission were made from them. We cannot consider a sketch of this mission however brief, complete, without giving due credit to the Very Reverend Angelo Casanova, parish priest of Monterey from 1869 until the time of his death in 1893. This zealous priest undertook the work of restoring the mission for a portion of it was in ruins, and to-day there would be but little of San Carlos to see and admire but for Father Casanova's timely work of restoration, which he accomplished with some help of friends, but chiefly with his own private fortune which he inherited. Many a time was Father Casanova seen assisting the laborers with his own hands. And what a happy day it was for Monterey when the first Mass was sung in the restored mission after years of vandalism and neglect! The old statues which had escaped the ravages of time were replaced in their niches, the sanctuary lamp was re-lighted for the Sacramental Presence once more enthroned on His altar and the organ pealed forth the ancient Latin hymns of the Church once more. Another very significant event of this restoration was that Father Casanova had the four bodies contained in the vaults of the mission exhumed and placed on new vaults, built however near the original spots "on the gospel side of the altar, within the sanctuary." The four bodies are the remains of Fathers Junipero Serra, Juan Crespí, Francisco de Lasuén and Julian Lopez. Another good outcome of this event was that it exploded the utterly unfounded story that a Spanish ship had carried away the remains of Junipero Serra to Spain. The vestments on each body were found in a perfect state of preservation at the time this work was done in 1882. For years the saintly Serra's body was buried under a pile of debris, but his "sepulchre has become glorious" in spite of all. And since the restoration of this mission, the feast of Saint Charles Borromeo, (its Patron Saint) has again been celebrated here every November the twenty-fourth, and a relic of Saint Charles which Father Junipero Serra brought from Spain, is as of old carried in procession. While this is of course a Catholic festival, reverent visitors of various creeds attend it. The mission is guarded by a care-taker, living in the premises of what remains of the old mission orchard. It was also due to Father Casanova, that Mrs. Leland Stanford donated, in 1890, the Serra Monument which crowns a slope just above the spot where this wonderful missionary said his first Mass in Monterey. We cannot give sufficient credit to Reverend Raymond Mestres, the present parish priest of Monterey, and a Spaniard from the Province of Catalonia, like Junipero Serra and many of the early missionaries. Father Mestres has given time, energy and noble efforts unstintingly to perpetuate the memory of Junipero Serra and to more fully restore not only San Carlos Mission and San Carlos Church, but is encouraging a movement to restore if possible all the California Missions according to their traditional and historical plans; may his great enterprise be blessed with all the radiance of crowning success! We will have ample reason to speak more of Father Mestres' good work elsewhere in this sketch, hence we will pass into Monterey itself. Monterey was named after the Spanish Viceroy of Mexico, who at the time of her discovery, was the Count of Monterey. As we have many times noted this city was of royal birth. Unlike any of the other Presidios, her Presidio was el Presidio Real, the chapel attached to it la Capilla Real, and the ships which sailed the blue waters of her crescent bay were the ships of the Royal Navy of Spain. No mission town was without its glories, its fascinating history or delightful surroundings, but Monterey was like a fair empress of them all. Yet no jealousy or feelings of rivalry were felt for Monterey by her sister towns, nor was her right to the sceptre ever contested. From the time that Sebastian Vizcaino placed her on his map in 1602 and glowingly described her beautiful harbor, noble forests and majestic hills, Spain focused her attention on Monterey, and when her Port was at last found by Portolá, and the stout old ship San Antonio under the command of Captain Juan Perez entered her harbor on May 31st, 1770, without any discussion or preamble she was made the capital of New Spain. The news of her discovery and of Junipero Serra celebrating Mass on her shores were sent with all possible haste to the Viceroy of the Spanish possessions in Mexico and to good Don Jose Galvez, also a complete statement of her discovery was drawn up and sent to the Court of Spain. And how were these news received? Solemn masses of thanksgiving were celebrated in some of the Spanish cathedrals, attended by many of the highest religious, civil and military authorities, while congratulations from every side poured into King Carlos and his Viceroy. And all this exultation over the discovery of the lovely spot we all know and love so well! Monterey, like a "pearl of great price" had been hard to find, but like a "pearl of great price" was worth the quest. Beautiful Monterey with her shores decked with Vizcainos Cross since 1602, Monterey with her bay blue like a turquoise, matching the azure of heaven, Monterey with her forests and flowers, with her Valley of Carmelo and glorious sunsets, adding to natures charms, her historical and sacred atmosphere, her landmarks and the improvements of man. No wonder thousands yearly throng this gifted spot of God's earth! As may be needless to say, Monterey, became the center of the social life, beauty and culture of the mission towns. From Monterey, inspiration flowed as from a fountain head. And even to this day she is irresistible. Even to this day, in spite of the many sad scenes and oblivious years which have stamped their trace upon her loveliness and impaired her regal splendor, her charm is told by her landmarks and crowned by her natural fortress of hills, her forests and flower robed meadows, and lulled at evening by the murmur of the iridescent waters of her bay reflecting the sunset splendors of the sky. About 1810 Monterey was ravaged by buccaneers under Blütcher, who was such a terror to many sea-port towns, these pirates sailed up the Pacific Coast, and appeared in Monterey Bay in four large vessels arriving at midnight. Before they could be driven out of the town they set fire to some of the Spanish Presidio homes and carried away precious jewels and silver belonging to the Spanish ladies, and provisions from the garrison. 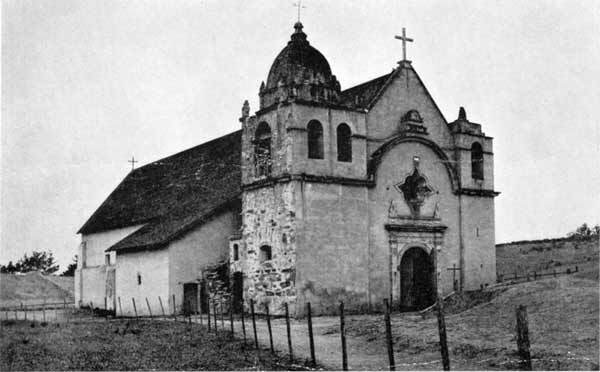 The former Capilla Real de San Carlos is now the parish church of Monterey, guarding like a fond mother all that remains of the massive silver altar vessels and candelabras, paintings, statues, vestments, manuscripts and archives of the pioneer missionaries of this mission. Among the modern attractions of Monterey we must not fail to mention Hotel Del Monte built and owned by the Pacific Improvement Company, and the many beautiful drives constructed by the same, company. Mr. Frank Powers was the founder of the flourishing settlement of Carmel-by-the-Sea, a few minutes walk from San Carlos Mission and a favorite resort of artists and literateurs. These with many others have been no small contributors to the old Capital. Thus while we deplore years of vandalism, and the thousands who have joined the "careless throng" we can always turn to the pleasing contrast of sympathizers and friends who are always, willing to give "honor to whom honor is due," and in doing so have spared neither purse nor efforts in aiding those who under difficulties have guarded the flame of tradition and love of the splendid past with its bright galaxy of "heroes, martyrs, saints." True, the glowing embers often smouldered beneath a debris of neglect and even harsh misrepresentation but were not and could not be extinguished. And now faithful hearts may beat fast with holy joy for the feeble light fanned by loving zephyrs has burst into a glowing flame destined to diffuse its love and influence to all, regardless of creed, race or station. The Very Reverend Angelo Casanova selected the writer of this sketch and her brother, then little children to unveil this monument.